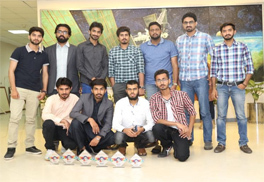 Students from the Department of Electrical Engineering, School of Engineering (SEN) at UMT won eight awards in the Institute of Space Technology (IST) Youth Carnival 2018 held in Islamabad. Around 10,000 participants from 40+ universities all over the country participated in more than 70 events. UMT team comprising two faculty members, Hassan Tariq and M Bilal Anwar with nine bright students Zain ul Abideen, M Nouman Rafi, Sajjad Ali, Awais Murtaza, Umar Qayyum, Zahid Mehmood, Ibrahim Farman, Ahmad Akram and Muhammad Othman Sharif participated in the event. Winning position secured by Umar Qayyum, Ahmad Akram and Ibrahim Farman (with the cash price of Rs 3500/-). Winning position secured by Zain ul Abideen, Zahid Mehmood Subhani and Umar Qayyum (with cash price of Rs 3500/-). Runner-up position secured by M Nouman Rafi, Ahmad Akram and Sajjad Ali. Runner-up position secured by M Awais Murtaza, Zain ul Abideen and Zahid Mehmood Subhani. Runner-up position secured by Ibrahim Farman, Sajjad Ali and M Othman Sharif. · First position secured by M Nouman Rafi, Umar Qayyum, Ibrahim Farman, Zahid Mehmood Subhani and Zain ul Abideen (with cash price of Rs 3500/-). Runner-up position secured by M Othman Sharif.